I had an amazing, unexpected experience last week. I was out mowing the front lawn when a truck drove by and I saw someone give me the quick sideways look. The truck turned around and two large men got out. It was Travis and Dan, members of my first Leadership class at Centennial, who graduated in 2008. For the next hour we shared stories and memories about all the things they had done in Leadership at Centennial. Some things I knew about and some I was hearing about for the first time. One of them is an Arctic pilot and the other is studying accounting. I was on a high the rest of the day. It was so great that they stopped to talk and shared with me how much they enjoyed their time in Leadership. It reminded me why I teach Leadership. It can change kids lives. So if you sometimes wonder why you work with kids keep it up because you never know the impact you are having. 1. 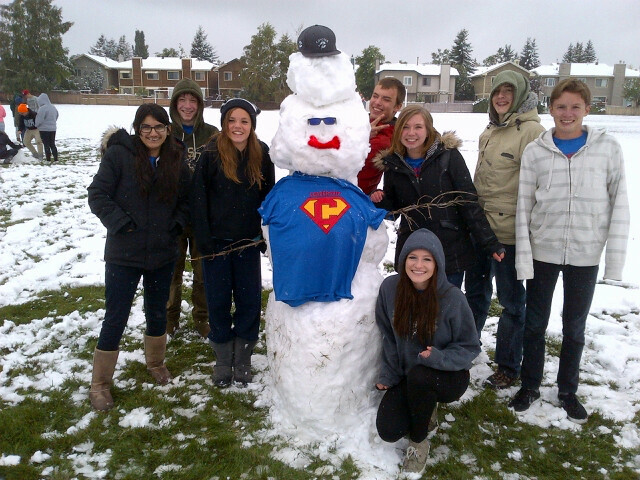 A Grade 10 student was the driving force behind the activity. It was her idea and contact that got us the car. She led the committee that planned, advertised, and carried out the activity. She also had an huge smile on her face as the activity went great. 2. 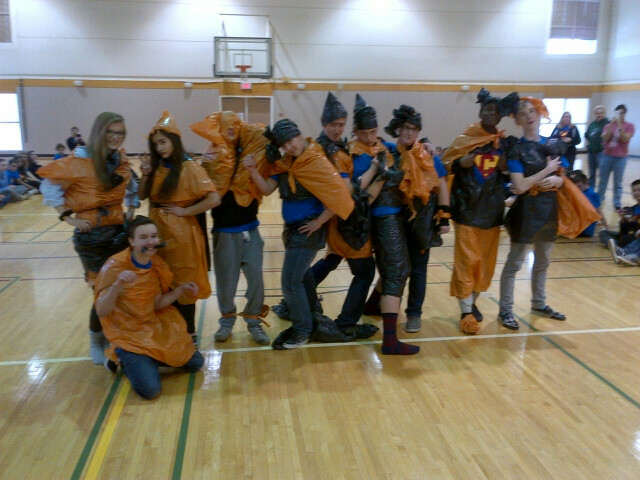 Lots of students, some who had not participated in a leadership activity before, got involved. They had fun and raised lots of money for a great cause. They cheered each other on with big smashes and encouraged those who missed to take another shot. 3. 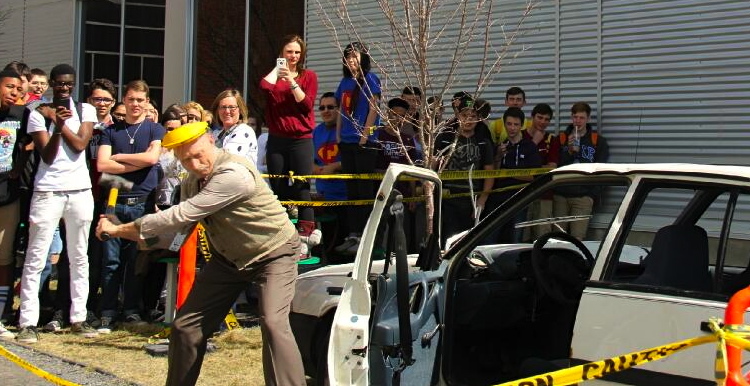 Admin Involvement – Our Principal also took some mighty swings. There were more cheers for him than anyone else. One student shouted out “Put the fear of God in us Dr. Christison!” while he was swinging. Our Principal led by example and students connected with him. It reminded me how important Admin support is for a successful Student Leadership program. We are fortunate to have an Admin team that okayed the activity and supported it and other activities throughout the year. Be sure to take the opportunity to build positive relationships with your Admin team. Make sure they know what is happening, are comfortable, and that there are no surprises. If something unplanned does happen (this is Student Leadership so that is inevitable) go with full disclosure and work together to solve the problem. Don’t forget to give thanks and show appreciation for the many things they do. Take a risk – Smash a Car! I am continually amazed at the Tech abilities of my leadership students. This week I was either hacked or spammed on Twitter. I had no idea, but Ethan the Leadership All Star texted me and warned what happened. My reply was thanks, what do I do now. He texted me through it and all is good. In class I was impressed by Nicole’s iPad skills as we were constructing some things for a Leadership project. I realized I am barely scratching the surface of what I can do with my iPad. I made her promise to give me a tutorial when things calm down a bit. What do I offer in return? I try to give digital citizenship advice and provide mentorship regarding the activities we offer and promote online. I love to learn new things and I think it builds the skills of our students to go to them and use their expertise. I was sharing some tech knowledge with some friends my age and they were impressed by my skills. They wanted to know how I had figured all this out. I told them I go to my tech Yodas, my Leadership students. Centennial’s Sr. 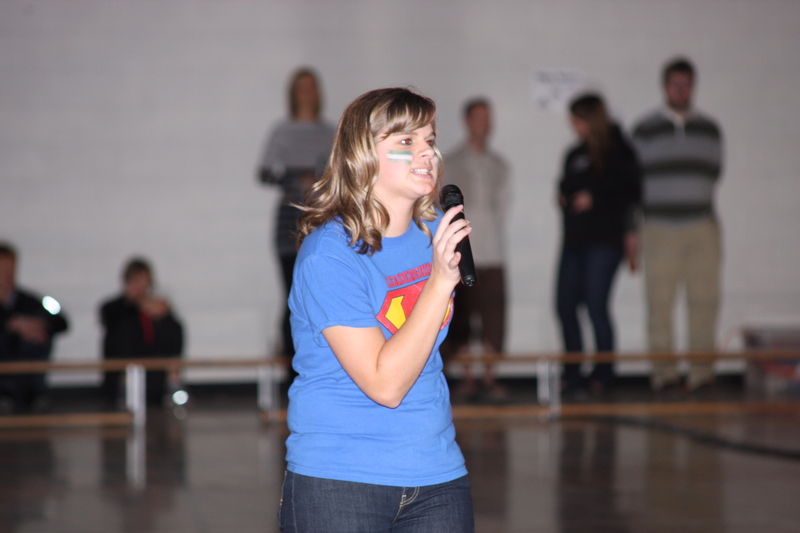 Leadership Class put on an amazing pep rally Friday. So proud of my students. Here is the video they showed. I am excited to start up this blog dealing with the world of Student Leadership. I have been involved as an advisor for 15 years and have also had the opportunity to speak with students and Advisors across Canada. Brent is married to the amazing Krista and is the proud father of four boys.